Rose Coschignano/Pipe Dream Photographer Freshman guard Sam Sessoms went 10 for 17 on field goals and totaled 22 points in a blowout loss against Hartford. 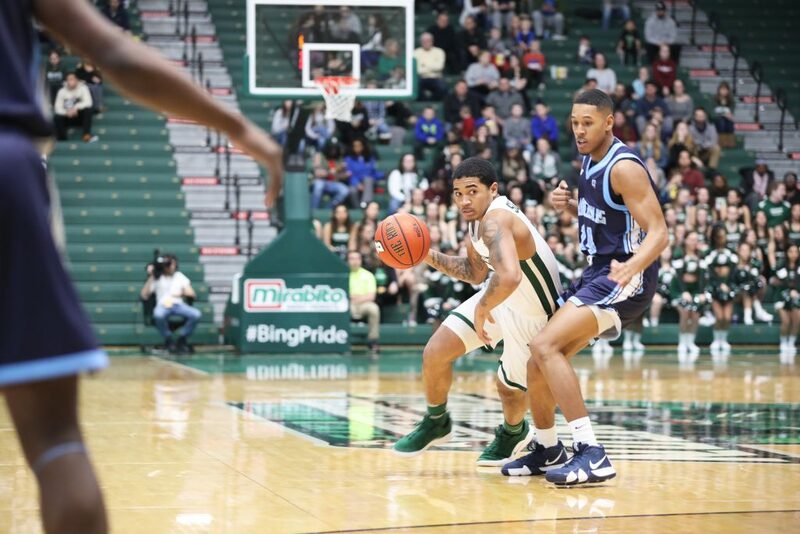 Despite coming off a solid victory over Maine this past Saturday, the Binghamton men’s basketball team was bulldozed by the Hartford Hawks Wednesday night. The Hawks, who entered the contest with only a modest 3-3 conference record and 10-11 overall record, dominated the Bearcats, 86-60 in West Hartford, Connecticut. A combination of porous defense and stagnant offense characterized most of the game, especially the first half. The Bearcats (6-16, 2-5 AE) converted only 37 percent of their baskets and 18 percent of their attempts from distance in the first 20 minutes. BU attempted just two foul shots. While freshman guard Sam Sessoms had a team-high 11 points at the break, a lack of production from graduate student guard J.C. Show and senior forward Caleb Stewart largely sealed the game by halftime. In addition to the struggles offensively, the Bearcats could not contain the Hawks on the defensive end. Hartford took a 17-point lead into the midway point to the tune of 57 percent from the field and a beyond efficient 75 percent from long range. The Hawks also out-assisted Binghamton by eight dimes. Senior guard Jason Dunne paced Hartford with 12 points on four triples. The second half told a similar story for both teams, even though the Bearcats attempted 11 more free throws and shot a respectable 44 percent from the field. Show turned it around offensively, posting 10 points on 50 percent shooting. Stewart, however, continued to struggle, misfiring on all six shots he took in the period. He finished the game 1-10 to go along with 10 boards and eight points. Even though BU certainly shifted gears after a brutal first half and the Hawks came back to Earth, the first half differential proved insurmountable. Hartford still cashed in on 52 percent of its shots and 44 percent of its long balls. Binghamton’s inability to respond defensively laid any hopes of a comeback to rest. The Bearcats ultimately fell to Hartford, who led the entire contest, on a 26-point differential. The Hawks’ largest advantage was 34 points at 10:17 remaining in the second half. For Binghamton, road games have undoubtedly been a major story of the season. BU is now 1-10 on the road, their only victory over LIU Brooklyn back on Dec. 21. The Bearcats have now dropped five consecutive away matches and have four remaining in their schedule. In comparison, BU has a solid 5-6 home record. Up next for the team is another road matchup with conference rival Albany on Saturday. The Great Danes (7-15, 2-5 AE) edged New Hampshire in their previous matchup, 62-42. BU’s showdown with Albany will be its first of the season. Searching for its first conference road win, Binghamton will square off with the Great Danes on Feb. 2. Tipoff is slated for 7 p.m. from Albany, New York.